Today is Maundy Thursday or what I feel should be renamed Leah Chase Day – the Thursday before Easter. I’m turning to my hero – that national treasure of American food – Leah Chase – and her recipe for Gumbo Z’Herbes on what should be National Leah Chase Day! I just told my hubby that tomorrow is Maundy Thursday. His reply, rather in the spirit of Maggie Smith’s Dowager Duchess “Weekend? What’s a Weekend?” was “Must be a British thing, but in all the time I’ve known you I haven’t heard of this.” Well it’s not a British thing – it’s part of the church’s calendar. Holy Thursday or Maunday Thursday is the Thursday before Easter. 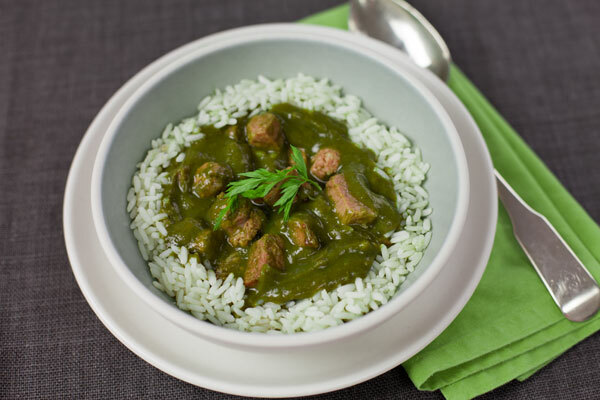 Gumbo Z’herbes is a dish saved for Maundy or Holy Thursday, the Thursday before Easter. This is the day when Christians commemorate the Last Supper. It is essentially a gumbo made with lots of slow cooked greens, including peppergrass and lots of meat and I was lucky enough to get the recipe from the Queen of Creole Cuisine, Leah Chase for Made in America. 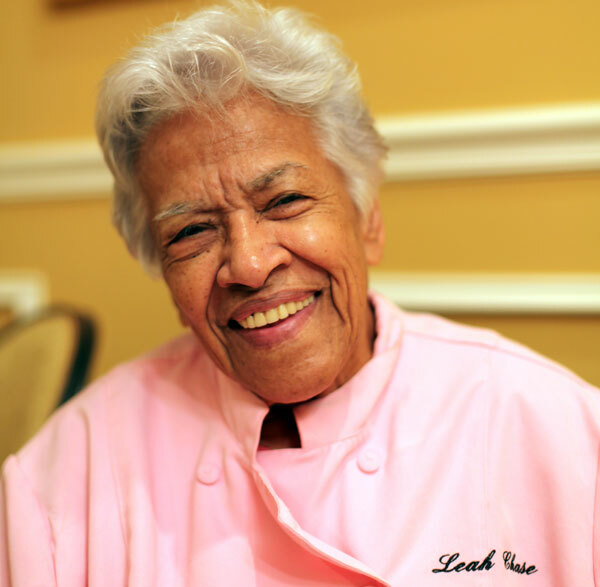 The octogenarian Leah Chase is the oldest of all the chefs across America that I have had the good fortune to meet and learn from and I would even go so far as to say she is the wisest. It was certainly one of the most memorable interviews I’ve ever done and I feel so lucky to have had time to sit and talk with Chase. As I listen to her stories about growing up in Louisana, days spent in the strawberry fields as a girl getting ‘culls’ the over ripe strawberries that were too sugary and squishy to ship North to make strawberry wine and the tales of voodoo surrounding her gumbo dish I am truly drawn into the Queen of Creole Cuisine’s realm. Born in 1923 in New Orleans it’s so refreshing to be talking history with someone who lived it, rather than just reading about times gone by in a book. 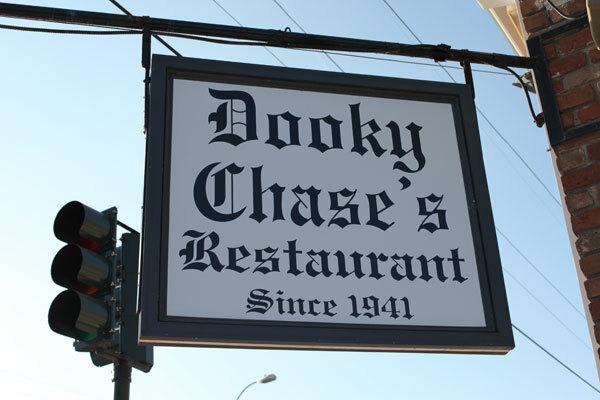 Chase cooks at Dooky Chase and has done since 1946– she didn’t found the restaurant, which opened five years before this, instead she married Little Dooky, the owners’ son. As a watering hole and place to hang and play music this restaurant has a rich and vibrant history – many of the great Jazz musicians of America have come here to play and eat Chase’s food. She is a living legend and I mean that quite literally, feeding Presidents (she scolded President Obama for putting hot sauce in her gumbo!) 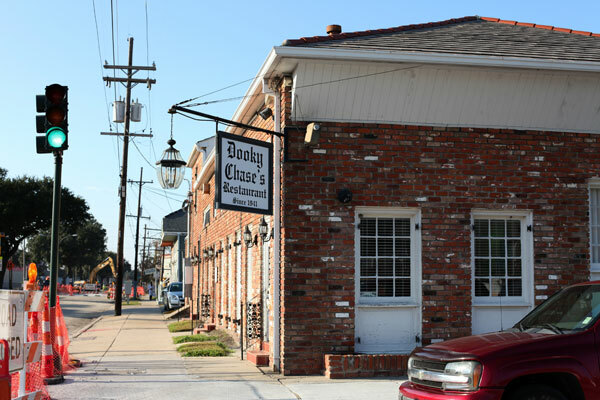 and Martin Luther King Jr. (Dooky Chase was the gathering place for the civil rights movement in the 1960s) and is a patron of the arts and in particular African American art, many piece in her collection hang on the walls of the restaurant. Chase has inspired Disney films (The Princess and the Frog), been honored so many times the list takes up two pages of her biography, is an oracle of a world that’s disappearing and still cooks and scrubs her pots in the kitchen at Dooky Chase. She was born into a family of 14 children in Madisonville, moving to New Orleans when she was 14. She has four children, sixteen grandchildren and four great-grandchildren. When Katrina devastated her restaurant she held a fundraiser on Holy Thursday – and what did she serve? Fried chicken, she makes some of the best anywhere, bread pudding and gumbo z’herbes, of course. The basis for gumbo is either okra or filé –Chase uses filé – that and a really thick brown roux. Add to this the long list of meats chorizo, ham, sausage, brisket and stew meat and this is one big pot of comforting gumbo. The words of wisdom from the person that this wise woman has most admired, among the thousands of people she has met, come from Howard Thurman,“if you sit quiet, and think, you will see what you can do and how you can do it.” Strikes me Chase rarely sits quiet for very long, there are pots to scrub, sauces to fix and hungry guests to feed. Jadin loin, gombo gaté. (Jardin loin, gombo gâté) “When the garden is far, the gumbo is spoiled.” An old Creole saying. Given the large number of green ingredients in this dish it is definitely one to make after a trip to the local farmers’ market. Leah Chase’s gumbo is so steeped in history and folklore it’s a shame to keep it to just one day of the year and remember – always use an odd number of greens. Serves 8 to 10 over steamed rice. 1. Clean greens under cold running water, making sure to pick out bad leaves and rinse away any grit. 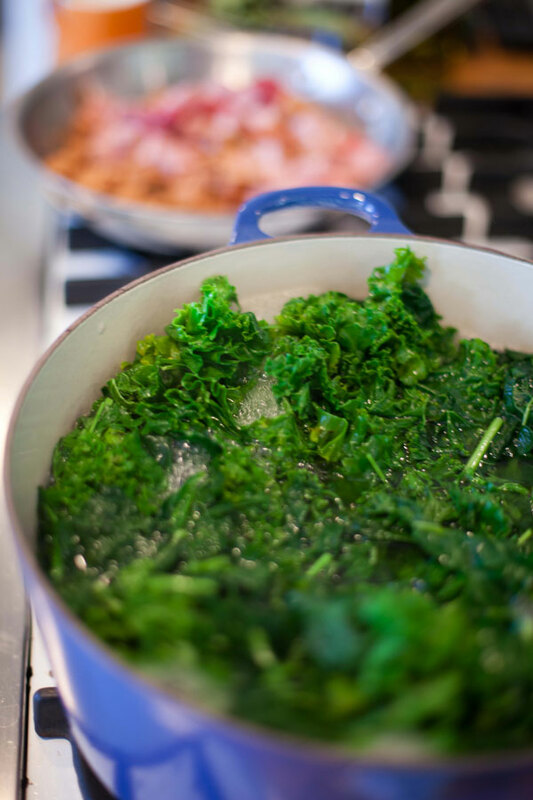 Chop greens coarsely and place in a 12-quart stockpot with the onions and garlic. Cover with water (about 1 1/2 gallons), bring mixture to a boil, reduce to simmer, cover and cook for 30 minutes. 2. Strain greens and reserve liquid. 3. Cut all meats, except the chaurice, into bite-size pieces (about 1 inch pieces) and place in 12 quart stockpot with 2 cups of the reserved liquid. Steam over a high heat for 15 minutes. 4. Meanwhile cut the chaurice into bite size pieces and place in a skillet over high heat to render, about 10 minutes. Remove chaurice, keeping the grease in the skillet and set aside. 5. Blend greens in a food processor until puréed. 6. Heat the skillet of chaurice grease over a high heat and add flour. Cook roux until flour is cooked, about 5 minutes (does not have to be brown). Pour roux over meat mixture and stir to combine. 7. Add pureed greens to the meat in the stockpot and 2 quarts of the reserved liquid. Let simmer over a low heat for 20 minutes. Add chaurice, thyme and cayenne, stir well. Season and simmer for 40 minutes. Stir in filé powder and remove from heat. Serve over steamed rice. Oh my, I have never had a green gumbo + simply must. Have been to NOLA 2 times and never to this classic restaurant. What was I thinking? I know exactly where it is…. next time. I adore gumbo z’herbes so thanks for sharing Leah’s recipe! Such a great recipe filled with classic ingredients and tradition. Thanks for sharing! My 5 ways to get lean, easy tips to a healthier you.